DietPi Version | cat /DietPi/dietpi/.version? SBC Device (EG: RPi 3)? Power supply used (EG: 5v 1A RAVpower)? SD card used (EG: Sandisk ultra)? Distro (EG: Jessie) | uname -a? [    1.807979] systemd: System time before build time, advancing clock. Why -bash: gettext.sh: No such file or directory ? [  OK  ] Root access verified. Why APT installation for: firmware-ralink, please wait.. every time ? firmware-misc-nonfree is already the newest version (1:20161130-3+rpt3). Why try wifi to start and Failed to try-restart ntp.service: Unit ntp.service not found. ? Failed to try-restart ntp.service: Unit ntp.service not found. invoke-rc.d: initscript ntp, action "try-restart" failed. Unit ntp.service could not be found. bound to 192.168.0.100 -- renewal in 3295 seconds. "Why -bash: gettext.sh: No such file or directory?" The error is because the gettext package is not installed. I had the same issue and 'apt install gettext' solved it. I started with a fresh install and didn't see the error. It showed up after I added software (Node-Red, I2C, RPI.gpio and WiringPi). The message is coming from the /etc/profile.d/wifi-country.sh file which is part of the raspberrypi-sys-mods package. Here it's started with a fresh install and try to configure wifi first time. It is no additional software installed. + DietPi-Config | Removed 'firmware-ralink' pre-req from WiFi enable. Why try wifi to start and Failed to try-restart ntp.service: Unit ntp.service not found. Cant seem to replicate this or find any reference to ntp service in our code. 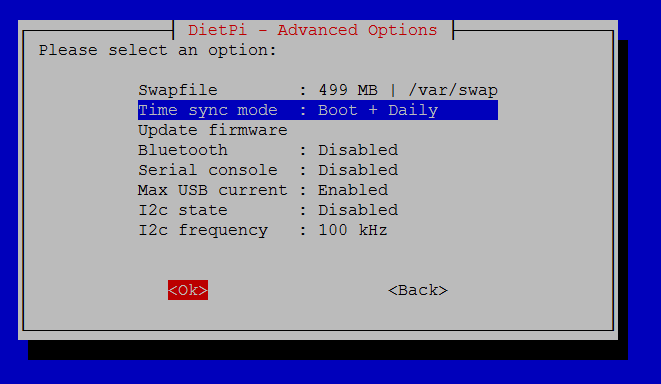 standard timesync mode used in dietpi-config? bound to 192.168.0.104 -- renewal in 626013797 seconds. bound to 192.168.0.100 -- renewal in 2811 seconds. I'll mark this as closed, as unable to replicate #1631 (comment) in v6.5 testing branch. If problems persist with v6.5 after release, please reopen with detailed steps so we can try and replicate. General | G_WHIP_*: Rolled out to all DietPi scripts. DietPi-Process_Tool | Added ability to add custom process entries to "/DietPi/dietpi/.dietpi-process_tool_include". Add one process each line with the format <chosenName>:<executableFileName>. Check via htop, e.g. "DHCP client:dhclient"
General | RPi: Resolved missing Allo Piano DAC firmware. DietPi-Config | RPi: Resolved missing Allo Piano DAC 2.1 entry.